Wright Chat :: View topic - Radiant Heat in Ceilings? His systems were steel imbedded in the concrete....do I have that right? His earliest systems were galvanized steel in a gravel bed below the concrete pad. Later he put the pipe in the concrete. I don't know if he used galvanized or copper when embedded in the concrete. I didn’t realize that he later put pipe in the concrete itself. Which houses have that? Wright notes in his autobiography that he first learned of floor heating in Japan while designing the Imperial Hotel. He had coffee while visiting a client in a room called a Korean Room in which a fire was built in a small fireplace beneath one corner of the room and the smoke and heat were channeled through chambers or ducts beneath the floor exiting at an opposite corner chimney. Wright notes that he designed steam pipes, that otherwise fed radiators, to be placed beneath the guest bathroom floors in the Imperial Hotel. The Jacobs and Johnson Wax buildings used iron piping in beds beneath the slabs. Wright used larger diameter pipe for steam, sometimes 2”. Later houses used copper or welded steel pipes. Sometimes beneath the slab, sometimes just touching, sometimes partially engaged. Our pipes are partially engaged in most places but fully encased in the kitchen which has a slab that bridges a small heater basement. What was actually built sometimes was determined by the mechanical contractor who would have to provide the warranty. In the correspondence for our house, we learned from letters back and forth that Wright tended to favor simplicity in the system design with fewer larger diameter pipes spaced a little further apart. Our house drawings noted pipes to be “copper or steel” 2” in diameter that simply “mowed the lawn” through the house in 2 zones (loops). 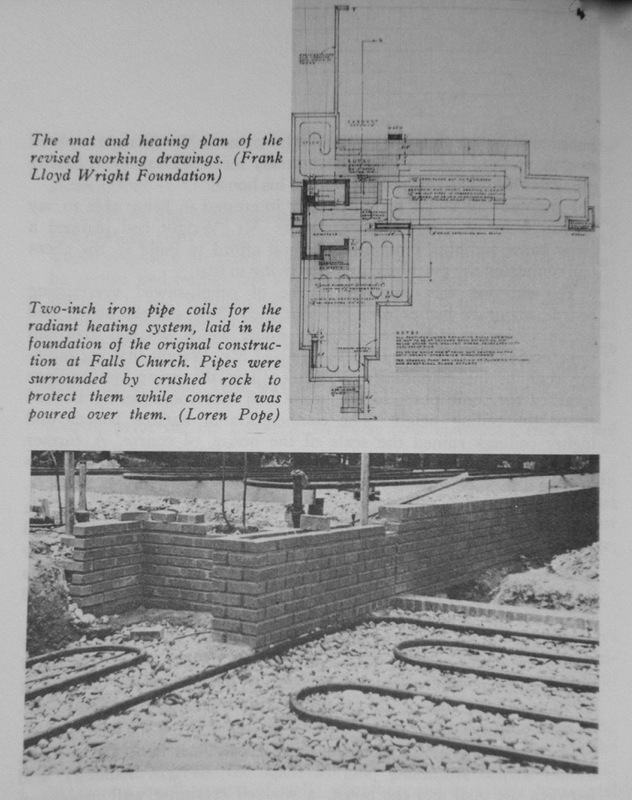 The letters described the Sweeton’s contractor lobbying Taliesin to use a 2 zone system as Wright spec’d, but with a supply pipe feeding a series of “panels” (sections of small diameter pipe that mow the lawn through a single room or portions of the house) that then return in individual pipes to balance valves that the drain to a manifold and back to the boiler. Taliesin agreed to the system in practice, but noted there was concern about excessive cost for a house with a tight budget. Mr Sweeton with his experience in controlling boiler piping in ships believed the increased cost was worth it. Steel pipe was used at our house. The pipe has had 2 leaks that have been repaired: one pin hole found when we built pier footings for the living room window wall mullions, and another that was a large hole breach in a riser pipe that was not even in contact with concrete, that seeped water into the work shop. In both cases, the pipe was repeatedly wetted from its outside. Surrounding pipe was in like new condition. In other Usonians I have encountered with steel pipe, failures have most often been traced to wetting of the outside of the steel pipe either by ground water, roof drainage seeping in, under slab plumbing pipe leakage, or in the case of the Rubin house, a cracked concrete fountain pool. Copper is not bullet proof either...the Christie house has had some leaks...all repaired. A Louis Kahn house owned by a neighbor has copper radiant floor heat which has had leaks. Copper pipe is thinner and can have chemical interaction issues with concrete, particularly if admixtures are present. No system is entirely trouble free. All must be cared for...don’t change the water if you don’t have to! Old funky water is most inert. Make sure the pipes don’t get wet from outside sources. Was radiant heat widespread? Is it Wright who popularized it, or were others involved in its promotion? The only section drawing in Monograph 5 (1924-36) depicting in-floor heating pipes shows them in the floor of the Great Workroom at Johnson Wax, where they are placed well below the slab. deck boards with minimal gaps. The 1938 Ardmore "Suntop Houses" are drawn with heating pipes at the top of a 5" rip-rap course and directly beneath a 3 1/2" concrete slab. Schwartz and Pope (1939) have 1 1/4" heating pipes above center in a 5" bed of broken stone or cinders (Schwartz) or crushed rock (Pope), beneath a 3 1/2" slab. Lewis has 2 1/2" heating pipes or "coils," suspended in the second-level joist space. mat.' Goetsch-Winckler same, with 6" of gravel or rip-rap. Brauner notes pipes 2'-0" on center. Christie (1940) shows 2" Wr. Iron heating pipes near top of 5" of broken stone. The 3 1/2" mat appears to have become standard. Model House for MoMA matches the Garrison spec, though pipe dia. and slab thicknessare not specified. slab. At Mossberg it's 2" pipes near the top of 5 1/2" of crushed rock. At Buehler (1948) it's the same, though the pipes have drifted downward to above center of the bed. drawing for Montooth (1950) has 2" W.I. pipe at the top of a 5" broken stone bed. shows no heating in the floor, but for the first time I see a steel "fabric" in the slab: 6" x 6", #10 #10, W.I. mesh. And that's it. Nowhere did I see indication of heating pipes embedded in the slab. I imagine Mr Wright was leery of seeing them expanding and contracting with temperature changes and cracking the concrete ? Where they buried in the crushed rock? If they were lying atop the rock then the concrete slab would have been poured over them, right? It's not like there was anything to prevent that unless they were buried. Hard to imagine them tamping down the rock with pipes buried below. If they were laid on the crushed rock, with rock around them so the surface was flat with the pipes just visible, as appears to be the case with the later examples as drawn, the result might be what DRN found at Sweeton. to the pouring of the mat. The height of the perimeter form boards suggests that the top of the mat would be well above the layer of pipes ? topped out flush with the perimeter brick course, it appears that the pipes would have abutted the underside of the mat, if not actually penetrating it. the photo does not show the complete fill of crushed stone. The Chadwick photo at Pope is interesting...the house is on two levels with the lower level in the foreground and the pipes of the upper level in the background set on 2x's..possibly awaiting crushed stone fill for final support? The pipes shown at Pope are the larger diameter/wider spaced pipes Wright used early on at this house, Suntop, Christie, and others. The pipes running downward into the subgrade are the supply and return pipes for the "panel" that served the lower level workshop. The pipe failure occurred in the small portion of riser pipe not set in crushed stone, but raw NJ sandy marl soil. The pipe to the left against wall is the workshop's return pipe which does a "homerun" return to the balancing valves in the heater basement. The larger diameter pipe to that pipe's right is the main supply pipe from which individual "panels" of pipe branch off to circulate through a room which are seen as the coil emanating from the cut slab. This system ensures that no area of the house is effectively at the end of the line following the water's long, long path through the house as with Wright's system. The pipes are partially engaged with the slab...in fact, the slab's welded wire fabric was twist tied to the pipes.